Field Work Begins in Panama Rainforest! We are delighted to welcome aboard Mariana Valencia, who will be serving as the Project Launch Coordinator for the ecoReserve-Earth Train project in Panama. Mariana is coming on initially in a 3-month contract position to help set up the logistics for the restoration/conservation project in the Mamoni Valley. Mariana will be working part-time in Panama City and part-time on the reserve. She will be working on creating access to the reserve, setting up the infrastructure for workers and the nursery, and fleshing out the Program Implementation & Monitoring Plan that was drafted by ecoReserve volunteers this past year (a big thank you to our volunteers: Joan Dudney, Dena Vallano and Yiwei Wang). She will also recruit advisors and identify prospective project staff. Mariana recently completed a M.S. in Science – Ecology and Evolution Program from the University of Illinois-Chicago (UIC). As a native of the Republic of Panama, she is passionate about forest conservation in Latin America. Her MS thesis led her to work on the restoration of lowland tropical rain forest in Mexico where she worked closely with farmers in restoration projects within rural areas in the Los Tuxtla Biosphere Reserve, Veracruz. She also has interests in working in temperate regions; therefore she developed her MS thesis manuscript on the restoration ecology of prairie systems in Chicago, IL. She is currently preparing her thesis for publication. 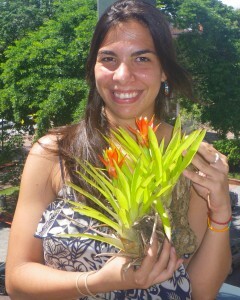 Mariana received her Bachelor’s degree in Biology, Emphasis in Plant Science at the University of Panama (UP). She worked for three years at the Smithsonian Tropical Research Institute along with scientists of many nationalities in five different sites throughout Panama. Through research and academic courses, she has spent valuable time working in Panama, Mexico, and the USA. These experiences have prepared her to manage and coordinate multiple tasks as well as collaborate with large international research groups. Concerned with the contradictions between economic development and conservation, Mariana is especially interested in working with small landholders on issues of sustainable land use and connecting the economic and ecological aspects of restoration efforts in protected areas. We are excited to have such a perfectly qualified person as Mariana in this key project launch position. Please welcome Mariana!